Schebler Carburetor - Flashback Fabrications Ltd.Flashback Fabrications Ltd.
It’s the same process to build all the carbs, but I am doing a run of 6 this time for Excelsiors #5 through #10, so you are able to see the process of the Excelsior carburetor manufacturing. Enjoy! 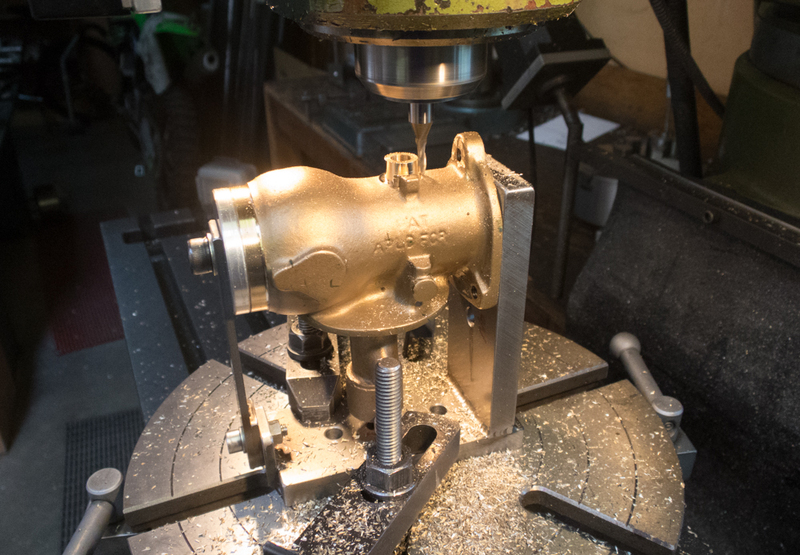 Machining the “excess” casting at the end of the carb main body. 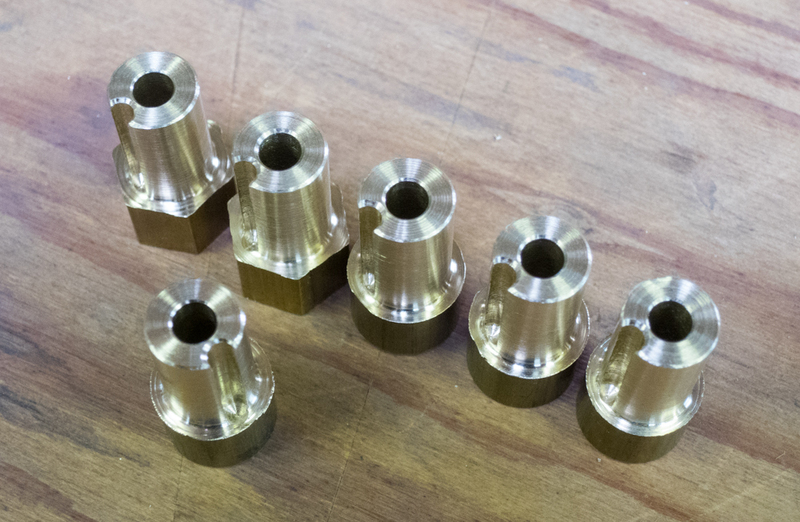 Six carbs waiting for the next machining operation. 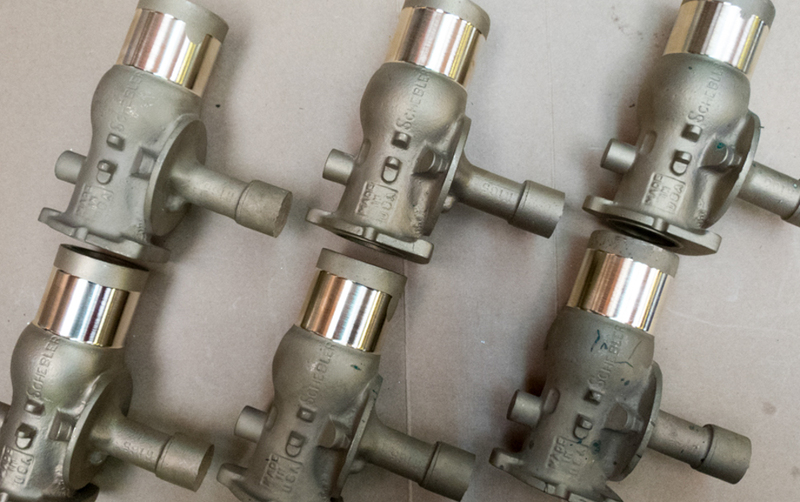 Turning the ID to fit the 1-3/8″ butterfly valve. 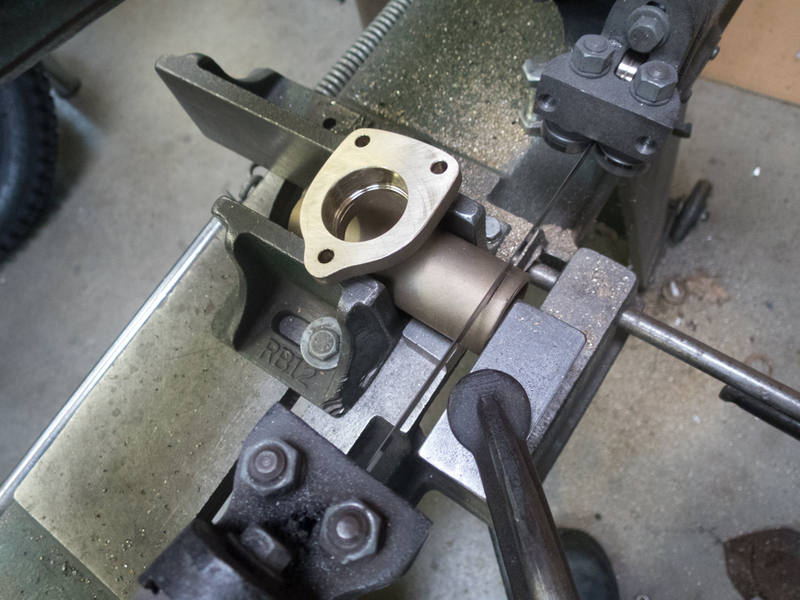 Drilling and tapping the mounting flange. Cutting the excess off the intake manifold in the band saw. 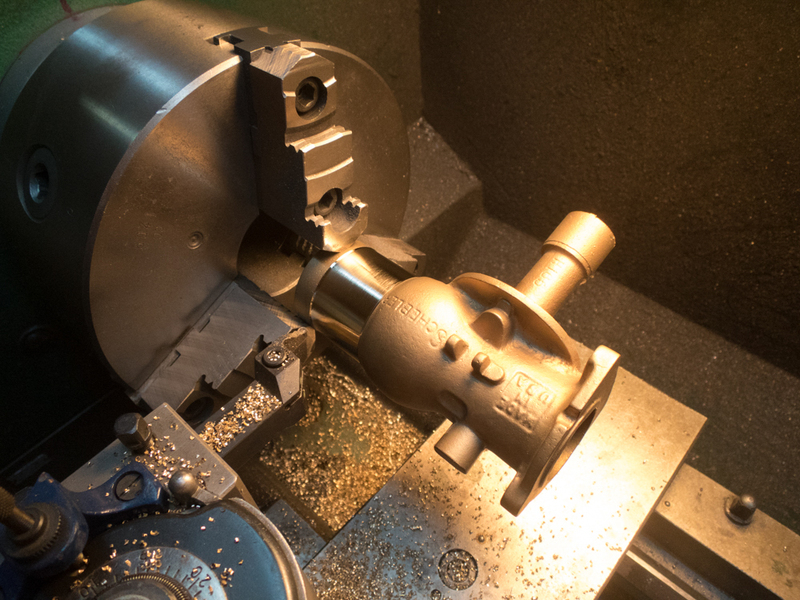 Machining the OD of the intake manifold with a 3/8″ carbide radius tool. 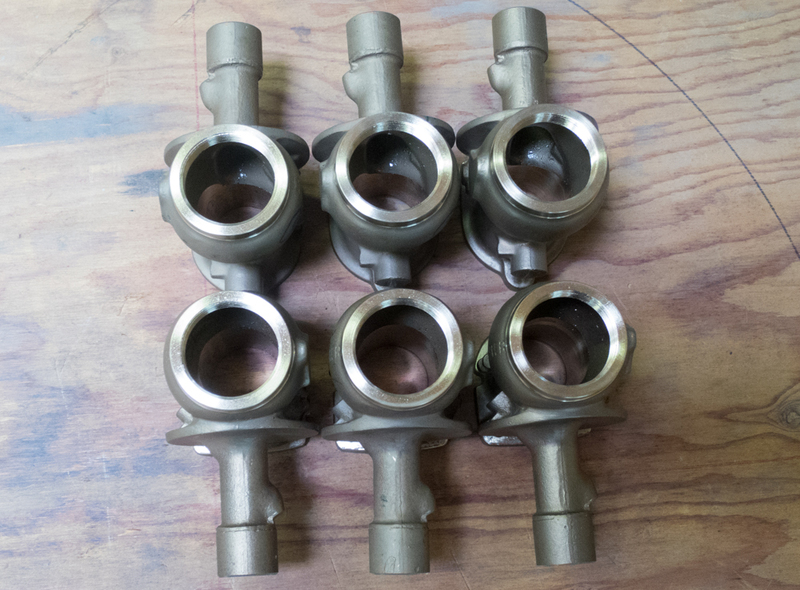 Six intake manifolds close to completion. 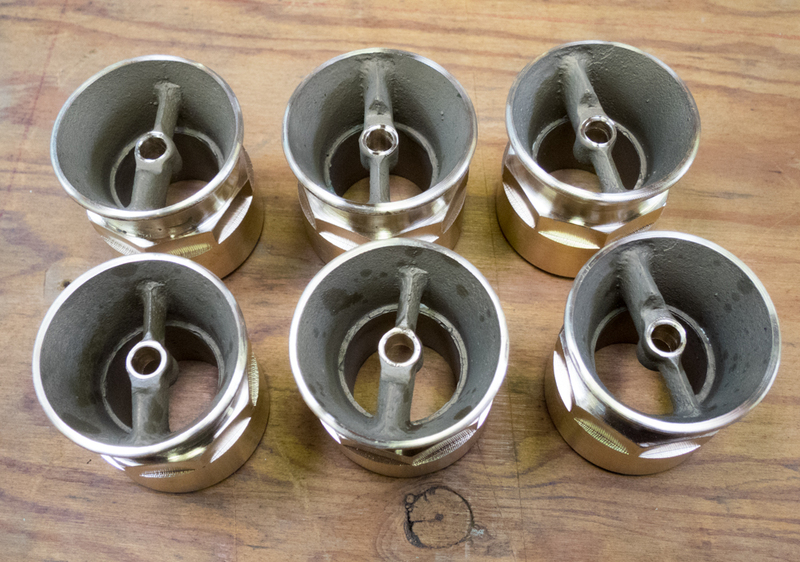 Six carbs with the ends bored and threaded for the ported air sleeves. 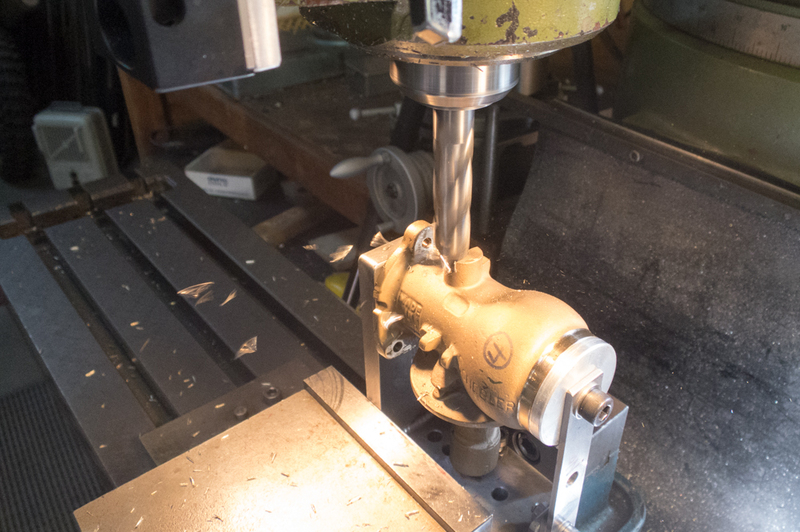 Milling the throttle shaft boss to the correct height. 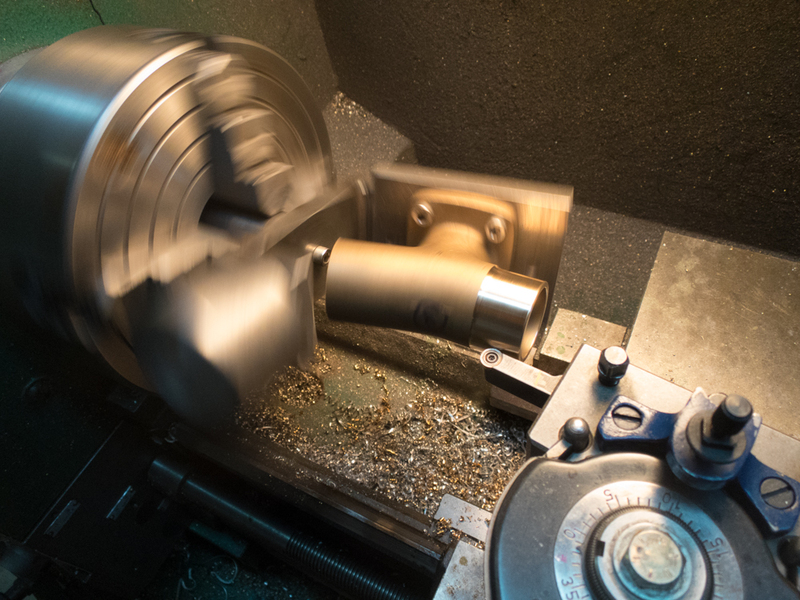 Milling the OD of the throttle shaft boss using the rotary table. 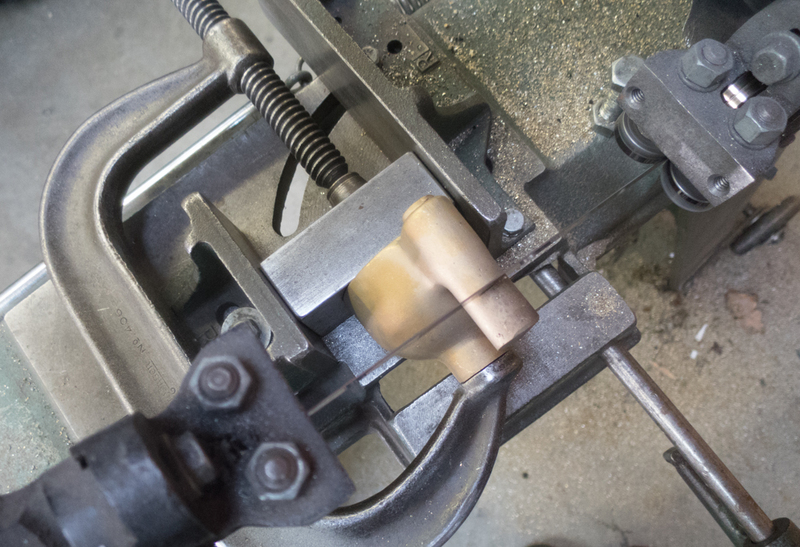 Cutting the excess off the float bowl casting in the band saw. 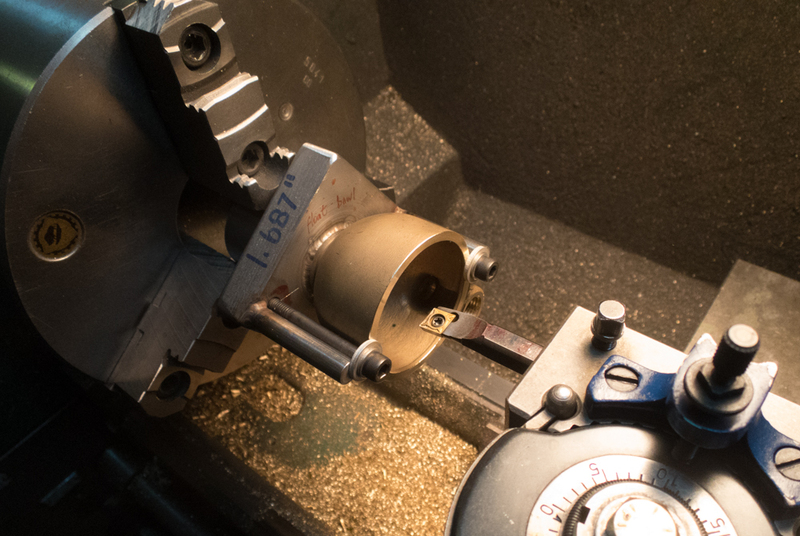 Using a boring bar to machine the ID of the lower float bowl. 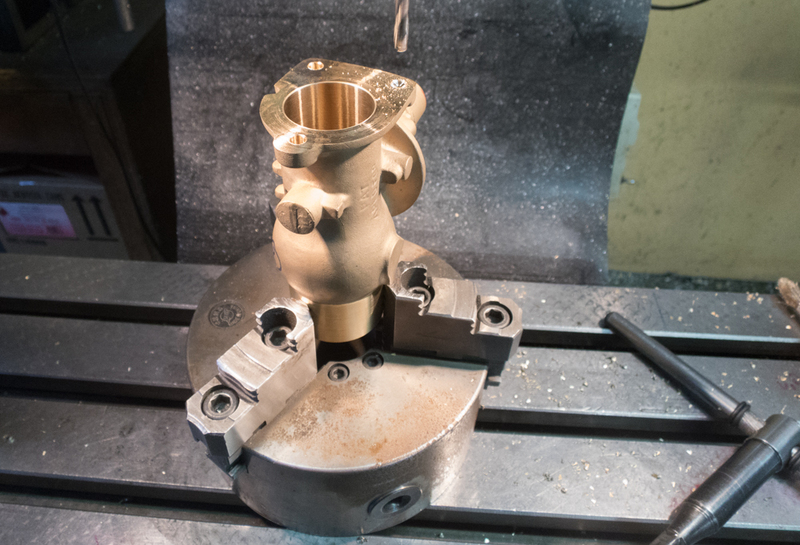 Using a fixture to hold the float bowl for the inner machining operation. 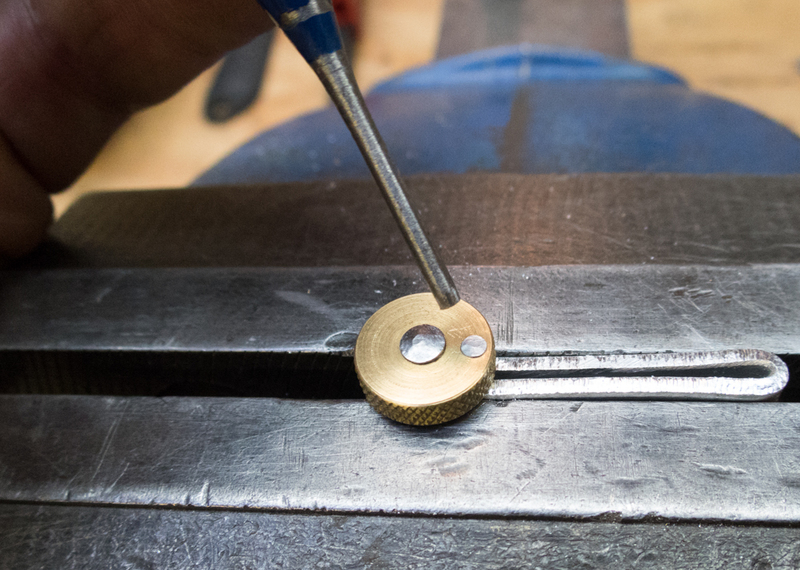 Using a 9mm endmill to spot face for the float pin holes. 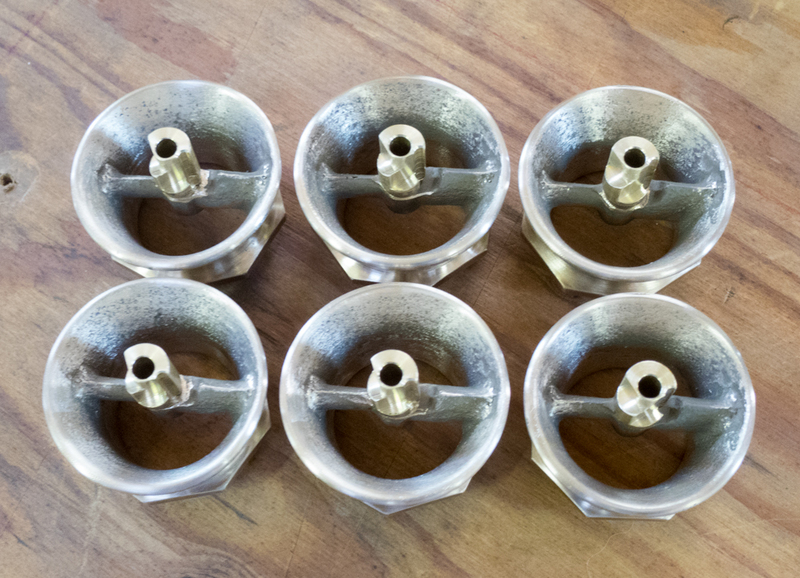 Stainless screws used to hold the float bowl pin. 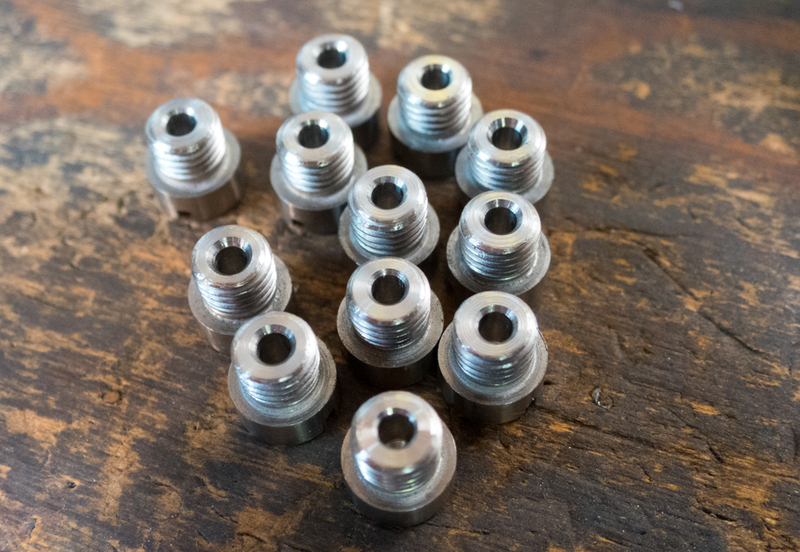 These get made from stainless hex bolts. 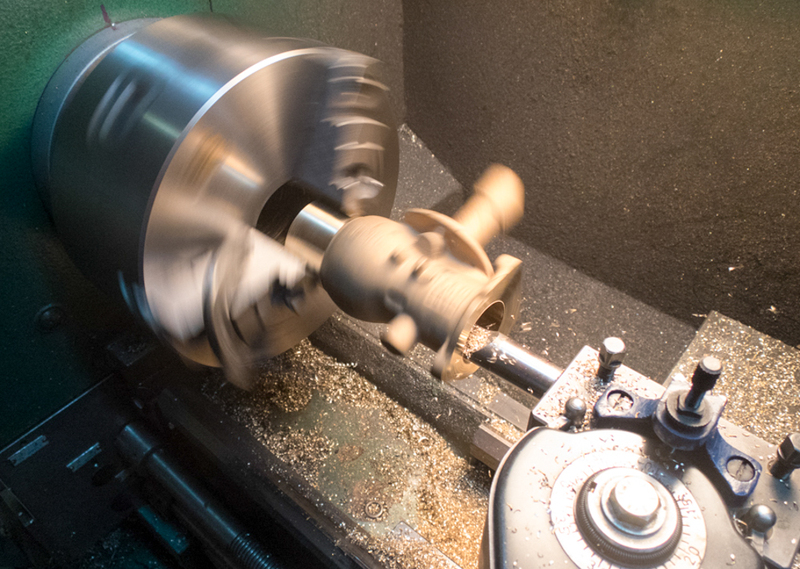 Holding the air horn in the rotary table chuck to mill the 8 sided octagon. But a hexagon only has 6 sides . . . 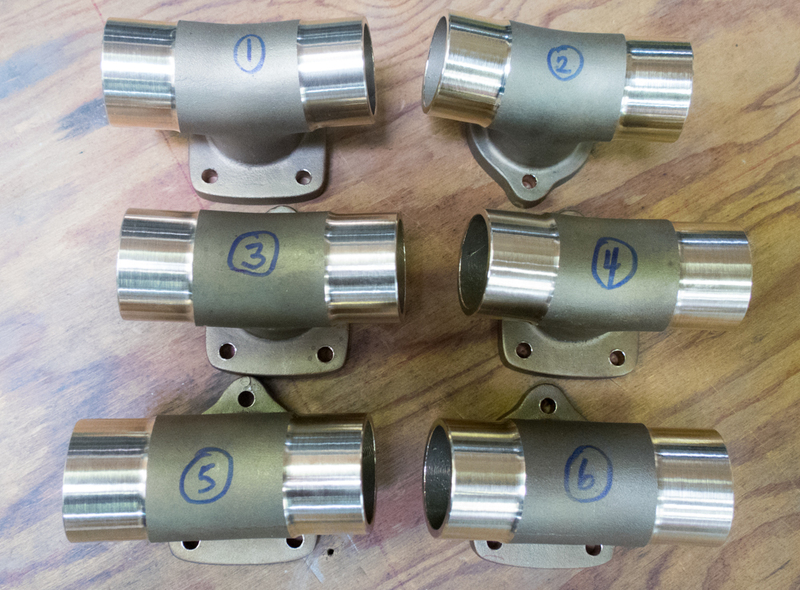 The six bronze air horns are coming along well. Using the horizontal hacksaw to cut off the excess casting that has been so handy for the previous operations. 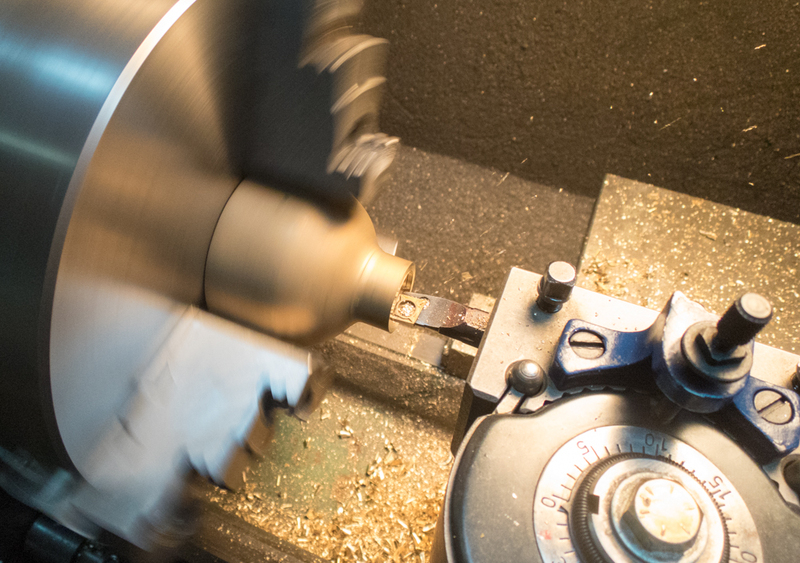 Cutting the threads on the lathe using a carbide insert tool. No coolant is required. 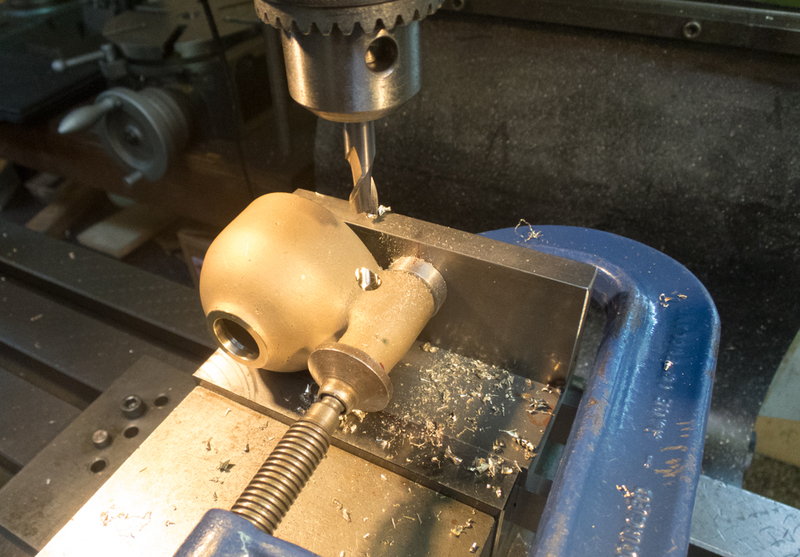 A 5mm allen screw holds the air horn into the aluminum fixture in the chuck. 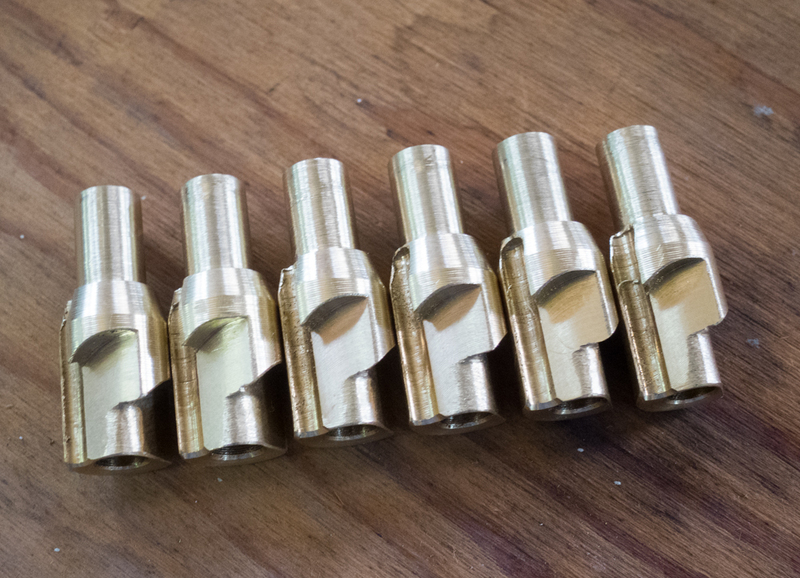 The air horn is now basically machined. 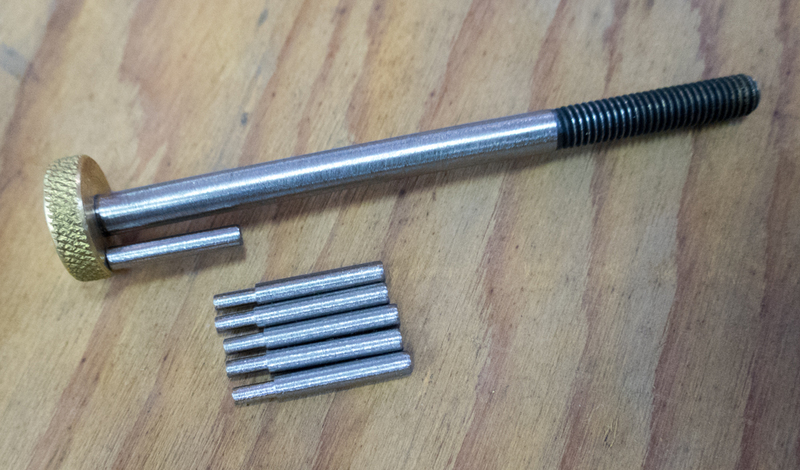 Now the bore needs to be smoothed and small parts made. 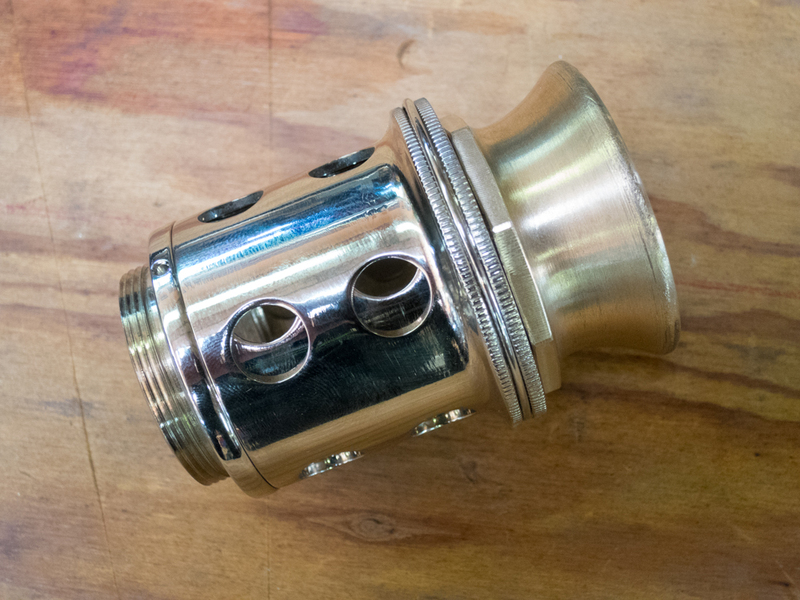 Here, the air horn is threaded into the “ported” air-sleeve supplied by Fred Lange in California. 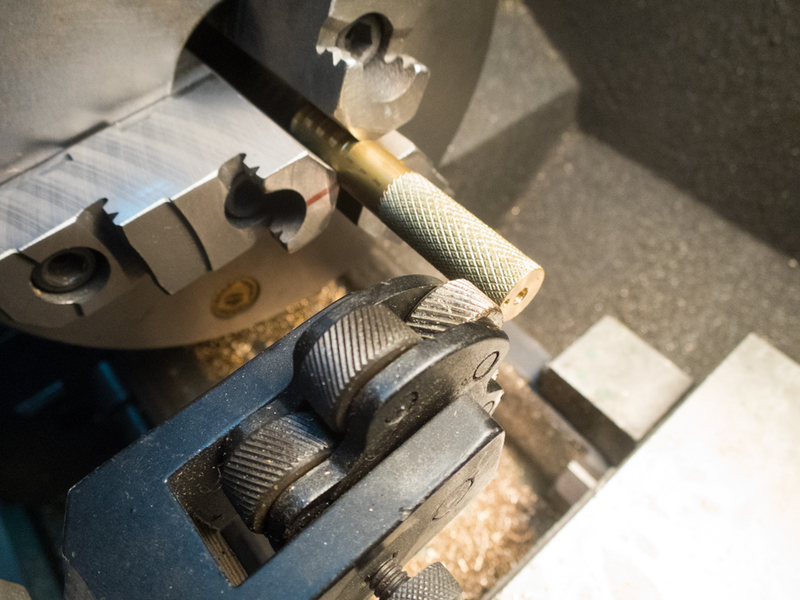 Knurling a piece of 5/8″ brass in the lathe at very slow speed. Two holes have already been drilled in the end. Short pieces will be parted off soon. 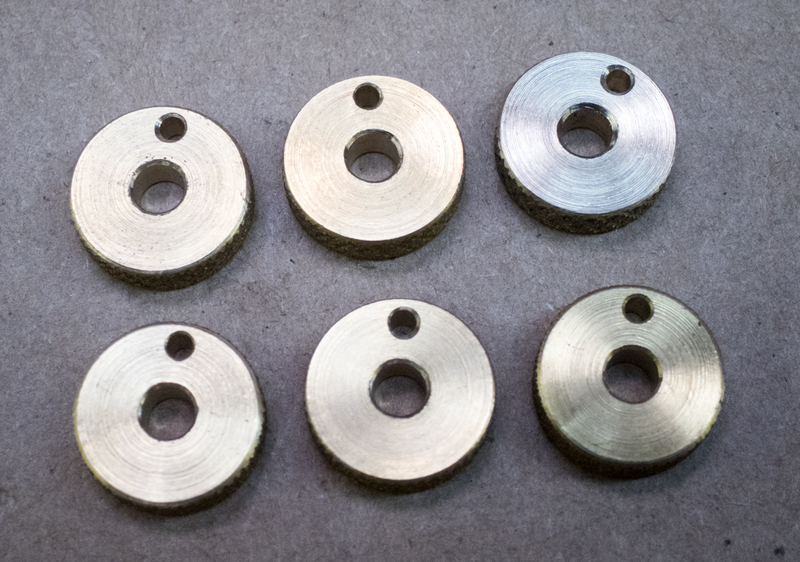 Six knurled knobs that have been parted off and chamfered, now await the installation of the screw and locating pin. The screw and locating pin have been installed with a light press fit. 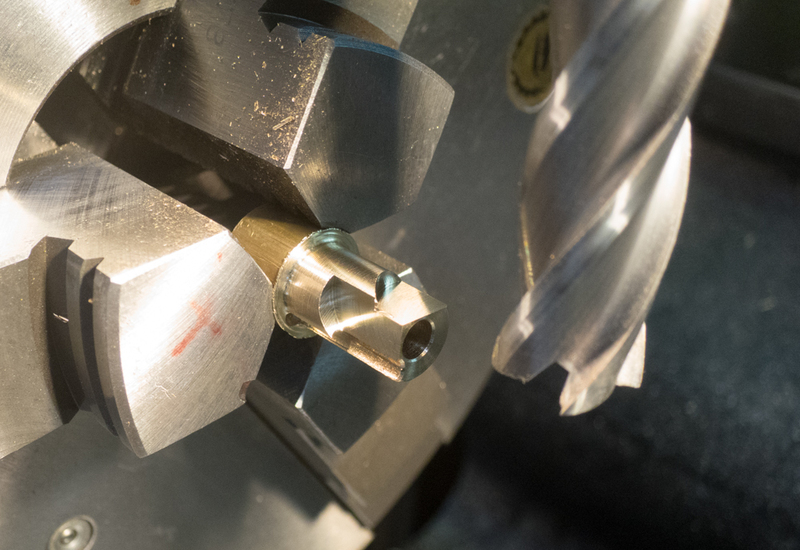 A small piece of 3003 aluminum is used as the soft jaws, and the ends are carefully peened over using a drift and a small hammer. On to the next stage. 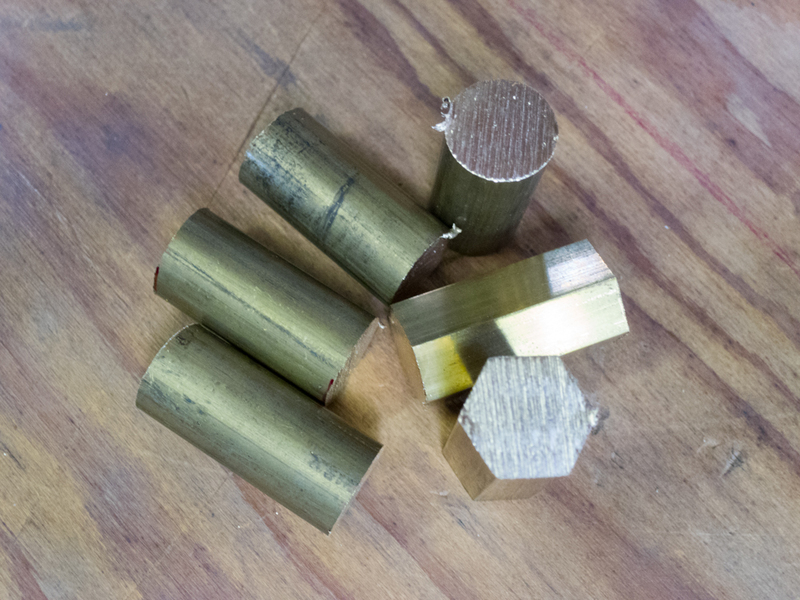 I have scoured my shop and found six (6) bits of brass for the carburetor air horn parts to be machined on the lathe. 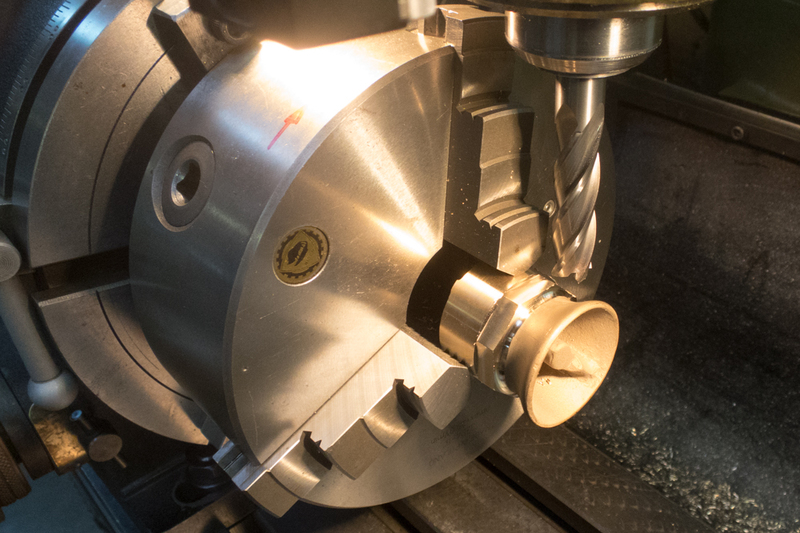 Here’s the process: Face the end, drill the center hole, drill the offset hole, turn the OD, and de-burr. 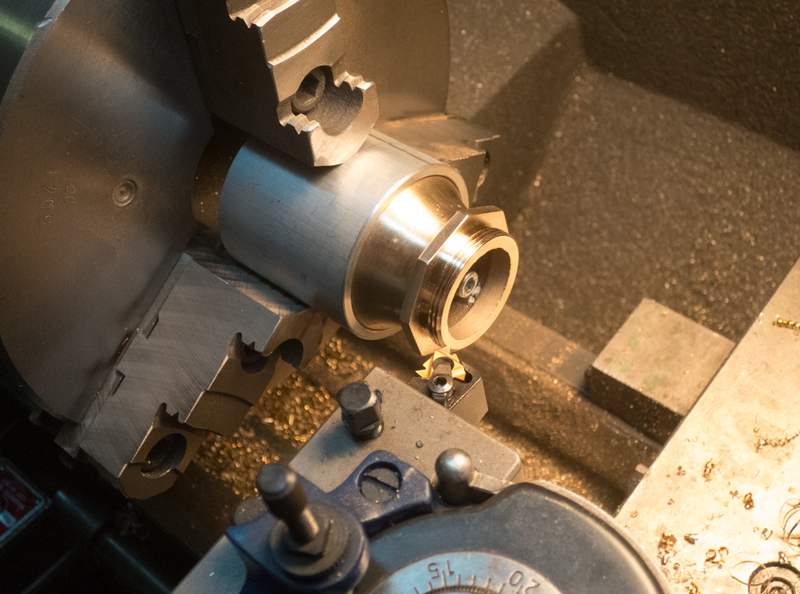 The bushing is held in the rotary table, and a carbide end mill used to create the cutouts where the pin will reset to hold the air-valve closed with more spring tension. This is a crude way of creating a “choke” for cold weather starting. 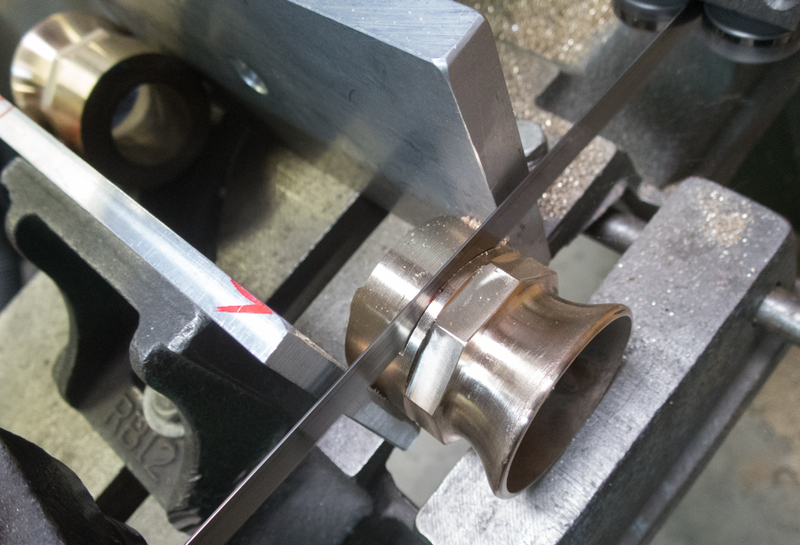 The other end has been machined to size, and now the bushing is ready to be lightly pressed into the air horn.